Tanah Lot temple nearly in the see when tide is high. For many things this location was something that is interesting . A cave of holly snakes which is located in front of the temple. That people believe they are the guards of the temple The view of the sunset combine with Tanah Lot temple, being one set that is very enjoyable to watch. Living cultural present a regular ceremony every six month where there where another ceremony at the same week in Pakendungan temple. 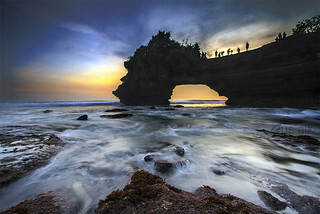 Tanah Lot is rocky beaches in effort of making nice wave. Because of the beauty, many tourists domestic or international come to this place. But if seen from management process, realized that the management of Tanah Lot need to increase creativity and performance to developing Tanah Lot Area. about package tours read more……..